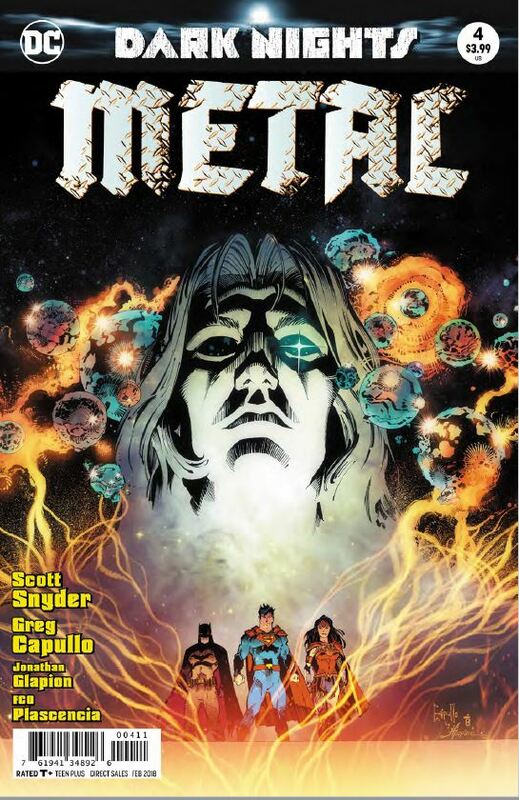 Dark Nights: Metal #4 Review – AiPT! I want to see where this is going, but I am concerned. There’s part of me that wants to succumb to the urge to just tear things down out of pure frustration. It’s part of the wider cultural zeitgeist, I think. We set ourselves up for impossibly high expectations and our perfect scenario of how things should go to make everything right, and there’s just no possible way any creator could ever live up to what we’ve created in our own minds. I have struggled through Dark Nights: Metal #4 for the past four days and I have put down my frustration, my unreasonable expectations, and my ideas for where things should be going. I hope I have not made a grave mistake. I’ve joked from the beginning that the general theme of Dark Nights: Metal and its various tie-ins has been “You think that’s dark? Hold my beer.” I honestly thought that issue #3 was rock bottom when Superman was (predictably) duped into rushing to the Dark Universe to save his BFF Batman and was instead (predictably) captured and used as some cosmic battery for our literal big bad, Barbatos, to bust his way into our universe and spread death, destruction, murder-Robins, etc. I thought that somehow at least one group of the varied A, B and C-team heroes scattered around the world and the galaxy would succeed even partially at their respective quests to bring some bit of the mysterious Nth — or ninth — metal back to Earth. I thought maybe even Kendra Saunders would find a way to be Hawkgirl again. I was wrong in so many ways. By the end of the book, I was just confused. Where did the giant reveal on the final page even come from? How did Sandman come into play? Why does Kendra have a brain in her pocket? Why are Batman and Superman suddenly 30 years older? I got some of my answers from looking back at the previous issues and prequels, but others I just have to let go and hold on, trusting that resolution is on the horizon. That’s a bit frustrating when there are so many things happening at once. I can’t quite keep a hold on all of the disparate plot lines on different planes of existence. Should I be paying attention to Wonder Woman, Dr. Fate and Kendra? How about Aquaman and Deathstroke? Why is Plastic Man in a Silly Putty Egg again? Why is Starro a) alive and b) talking like a complete douche? Again, I’m hanging on, hoping for answers. There are some very good moments in the book, however, even if all seems doom and gloom. Seeing the former Hawkgirl literally split apart as some demon version of herself rises from the gore is pretty sweet. Batman realizing that his kids are his happy place is really cathartic after so many, many years of him not having a family to pass his legacy too. The art, as in all the Metal books is top notch with some outstanding panels, including the appearance of Lady Blackhawk. I’m not giving up on Dark Nights: Metal, certainly. I will be taking each issue slowly, though, making sure that I’m clear who I’m following down which dark rabbit hole. I want to see where this is going, but I am concerned that the two remaining issues just won’t be enough space to tell the story that they’ve set up. I hope I’m wrong. I want to see where this is going, but I am concerned that the two remaining issues just won't be enough space to tell the story that they've set up. I hope I'm wrong.